We live in a “give-up” culture, meaning that most people just quit after they fail once. Whether it be a sport, grades, a relationship, or searching for a job, one “No” or “F” is all it takes for them to stop trying all together. It’s like this way because we hate to fail and admit that we’re not always going to succeed. But here, Paul reminds us that our efforts to do God’s work are never a waste of time in His eyes. You might invite people to church, or the same person for a long time, and they just keep saying “No” “No” “No.” But that is not failing. God wants us to put everything we have into doing His work, so never stop inviting people into His love. While we need to remain steadfast and immovable, we must be sure that we are “throwing ourselves into the work of the Lord”, and not into things of this world. But what does that mean? It means to love with patience, kindness, trust, and truth (1 Corinthians 13:4-8). It means to put your neighbor first (Mark 12:31) and to forgive 70 😡 70 times (Matthew 18:22). It means to worship (1 Peter 3:15). It means to be a light in the darkness (Matthew 5:16). You will get rejected, more than once. You will be pushed, shoved, and asked to move or stop being a certain way. You will probably get ridiculed for some things, and it will be hard at times to keep the faith. But remember that what you do always has a purpose. 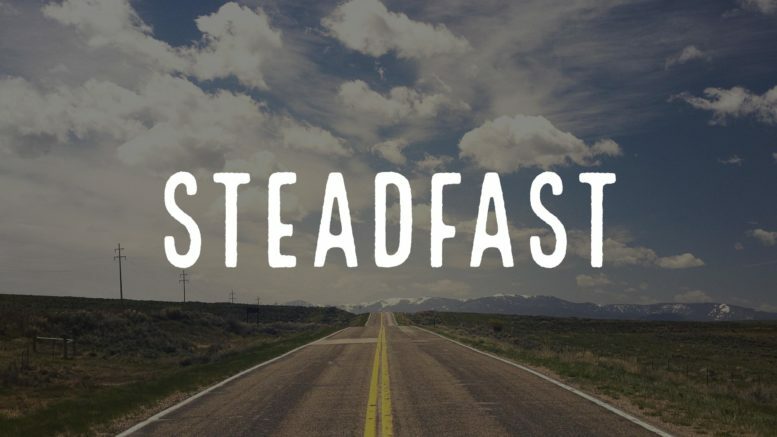 Be steadfast in your faith. Keep running with Christ, and don’t stop until you get home.